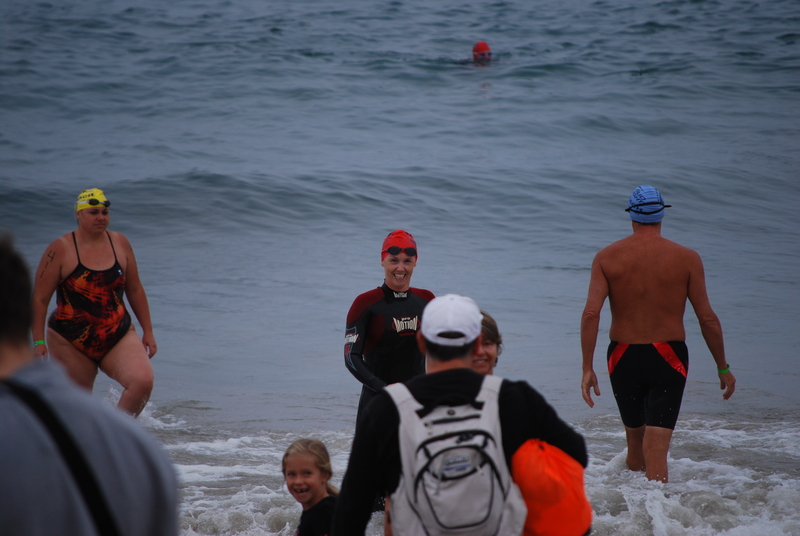 I was challenged by Leo, a friend on the Dailymile, to participate in the Dwight Crum Pier-to-Pier 2 mile open water swim. Since I don’t have anything major on my training plan right now it seem like a fun thing to do that I have never done before. 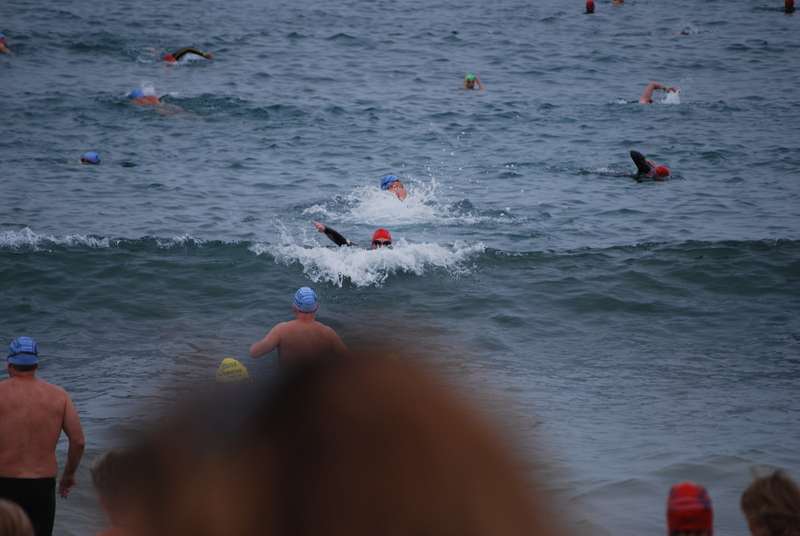 I have never raced more than 1500m in the ocean before and even though the swim in Ironman St. George was pretty intense, there is still something daunting about swimming 2 miles in the ocean. 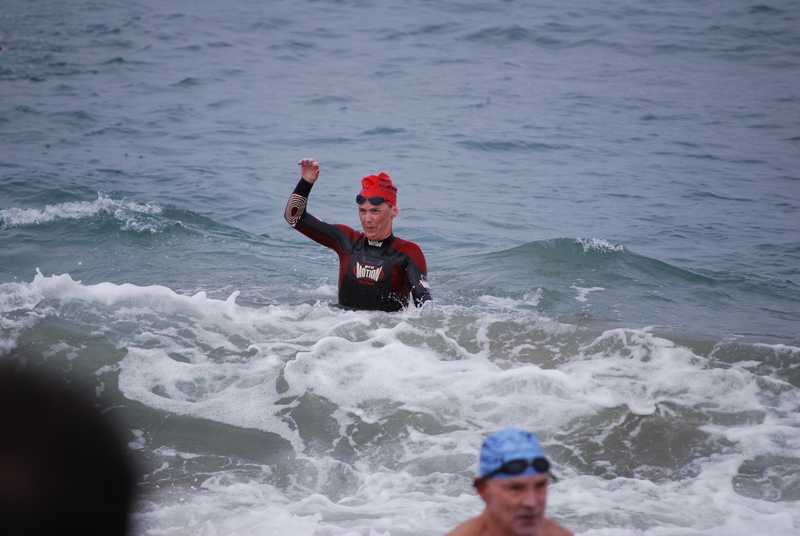 So I gladly signed up and squeezed in one ocean swim prior to the event. I had gone down the day before to pick up my stuff to make the morning a little bit easier. So once we got to the beach it was pretty much just suit up and wait. 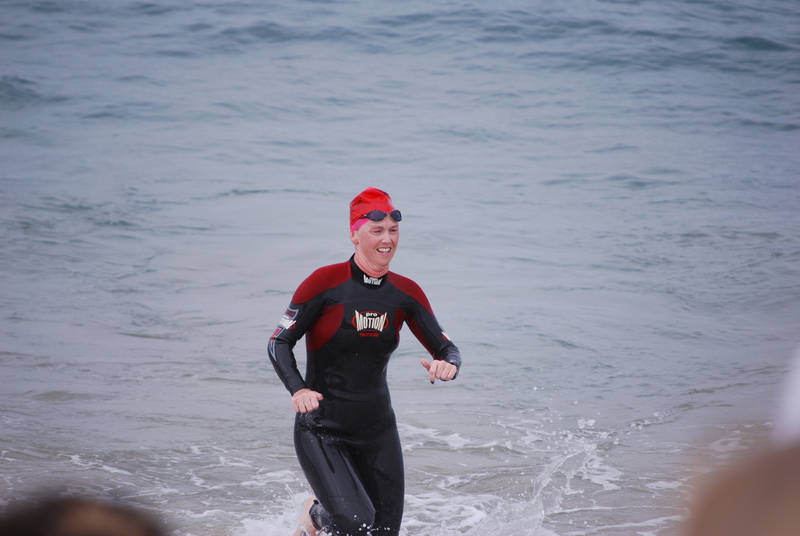 I put on my wetsuit (you can do it without…I don’t think so!) 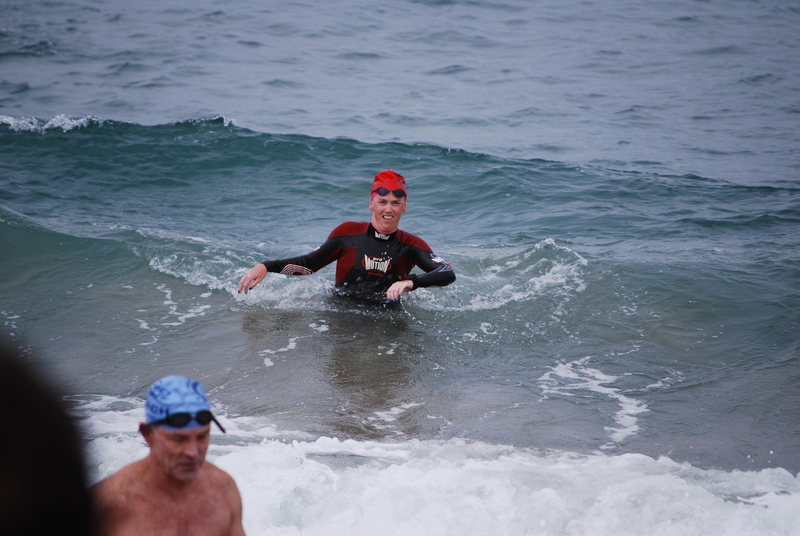 and got in the water to start acclimatizing to the water. Temp was perfect and the conditions seemed great! I lined up to start with Sheila, another Dailymile friend. We started a little to the left since the first turn was to be on our right; I didn’t want to get swum over if we were too close to the buoy. 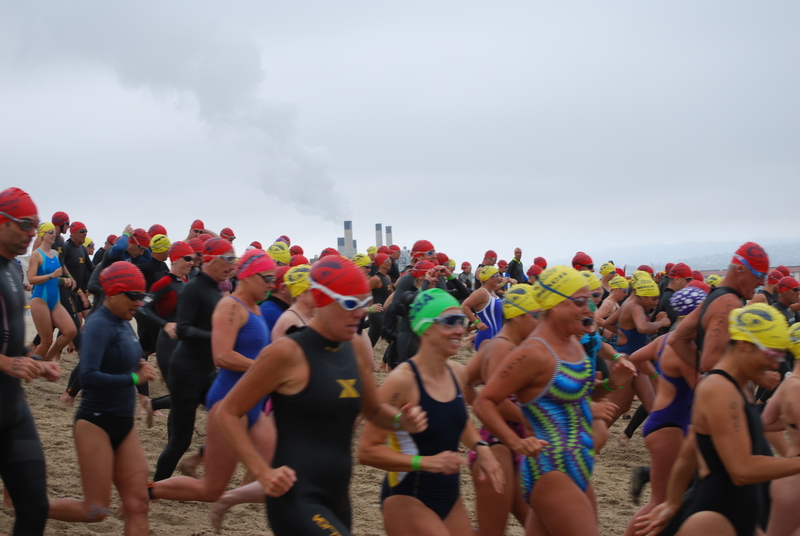 The course essentially is you start at Hermosa Pier and swim north to the Manhattan Pier. It was a wave start with easily over 500 people in it. 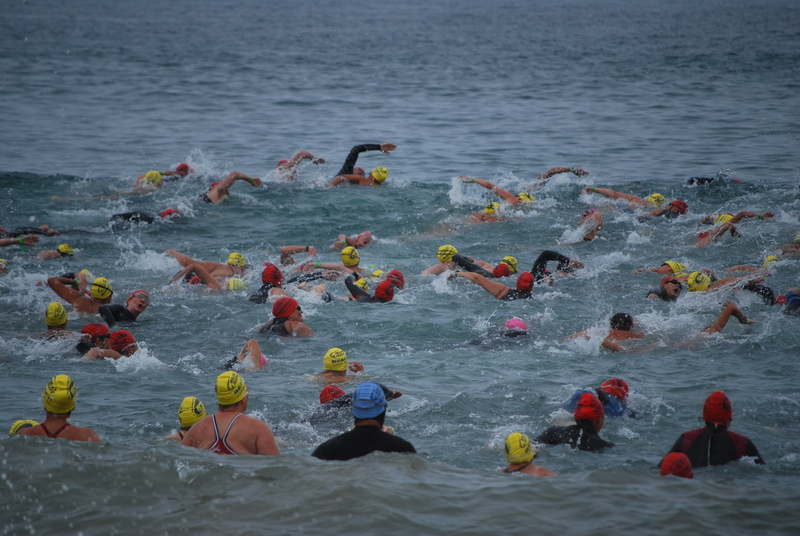 It was one of the biggest starts I have ever done because we started on the beach which is much more difficult than an open water start with that many people. After getting past the first buoy and hanging a right past the pier we were on our way. It was very crowded but people were pretty courteous and not overly aggressive. There was a lot of heads up swimming at first just because if you put your face in the water you had a really good chance of getting kicked in the face. Once we were in clearer water and swimming North parallel to the coast it was just put your head down and swim. 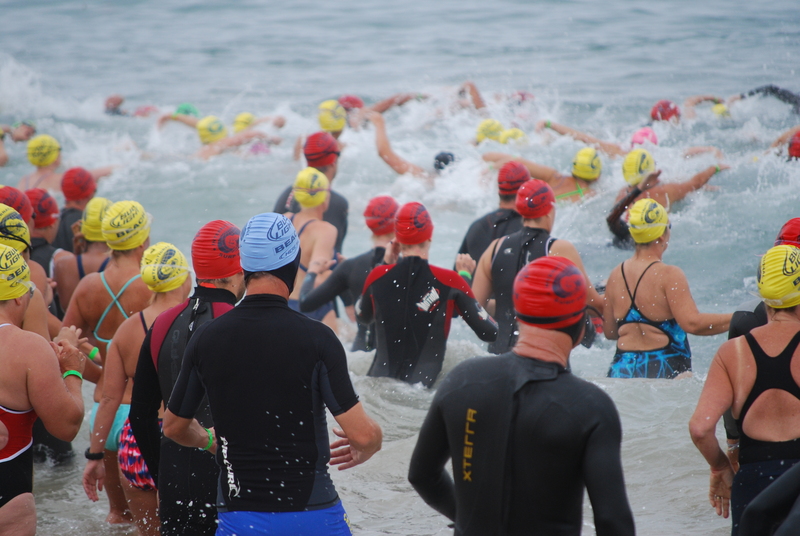 (Click here for the Garmin data) I am a pretty straight swimmer so one of the biggest issues I had was those swimmers (you know those ones!) that weren’t. 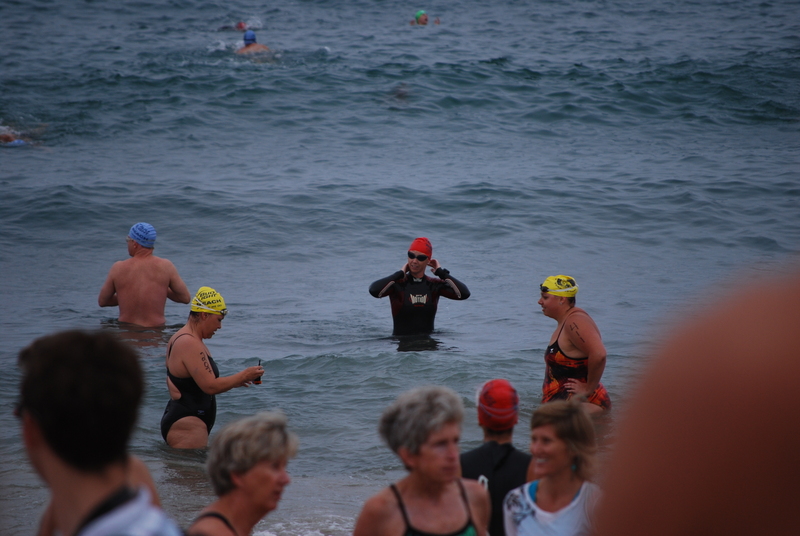 I was swum upon a couple times by people that couldn’t keep their line super well. Twice I had to stop swimming and get away from a couple that just really were too close (I am talking about you large man who bear-hugged me mid swim!). I finally got a chance to use my fancy schmancy Garmin 910XT and had set it up to buzz me ever 100 yds. 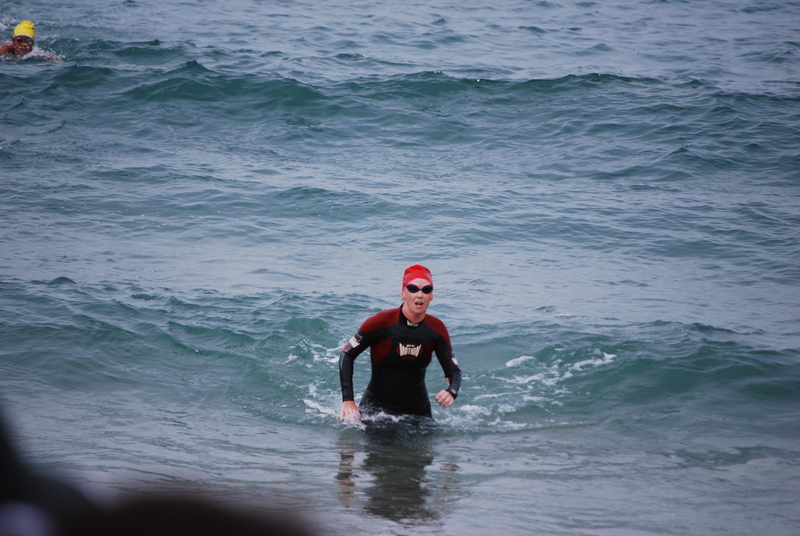 I didn’t feel it buzz until about 10 minutes into the swim which doesn’t mean it wasn’t but just that I didn’t feel it. Once I felt it, I used it as a good reminder that even if it didn’t feel like it, I was making forward progress. Later I would find out that my watch had me very short and I am not sure why. I am just glad, in retrospect, that I didn’t look at it during the race because I would have been very disappointed. At some point in the race I could finally see the pier ahead. I tried not to look for it too often because it really takes time to make forward progress I the ocean so if you look too frequently you don’t feel like you are moving anywhere. Instead I really used the paddle boarders who were lining the course to sight off of. The provided an excellent way to stay on course and if you look at my Garmin data you will see my path was pretty straight. Only problem with this method is that not ALL paddle boarders were lifeguards, some of them were paddling for friends, which made them a moving target. But they all kept me on course so that was great. It wasn’t until the last 400 yards or so that I started to get tired. I really struggled to not let people pass me during the last bit but I did finish strong and felt I had given it all I could. 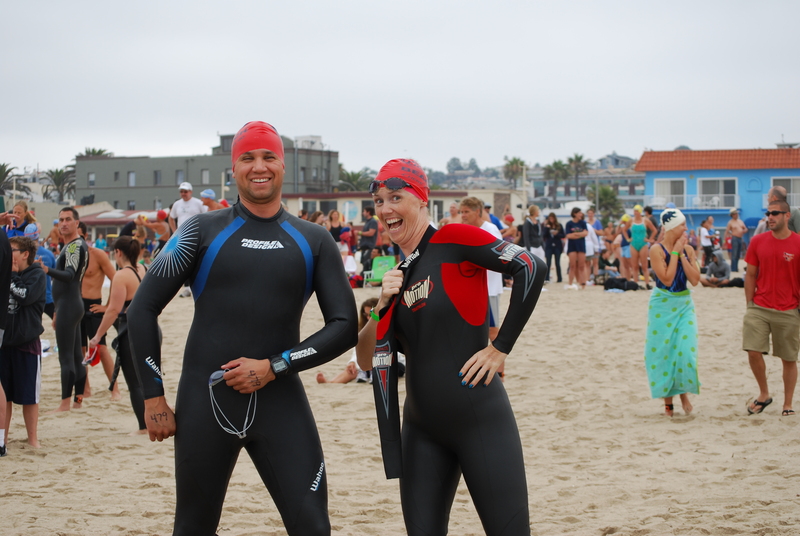 I got out of the water and found my Sherpa and we waited to see how I faired against Leo and Sheila. A couple minutes later Sheila came out and a few more minutes later so did Leo. 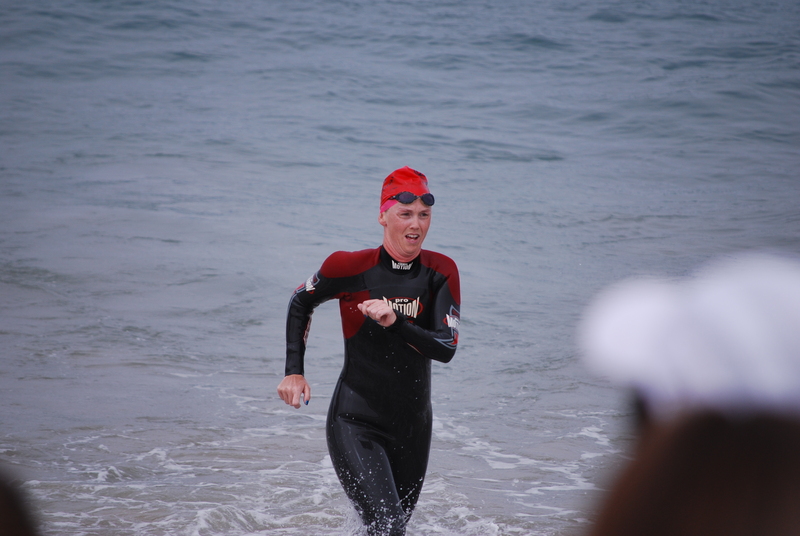 Overall I was THRILLED with this swim. 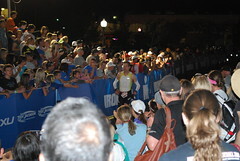 My goal had been to go under 1 hour but after the event I was very happy with my 1:02:14. I was so spent by the end that I feel that I did all I could have. Any harder earlier in the race and I would have pooped out even earlier. And even though my splits are wrong per 100 yards, they are pretty consistent, which is what I strive to do in any race. The day was a success, and in a year that hasn’t been as successful as I would have liked, I am very proud of my effort. I don’t think I am interested in doing too many more swims like this again. It is kind of boring to be honest. 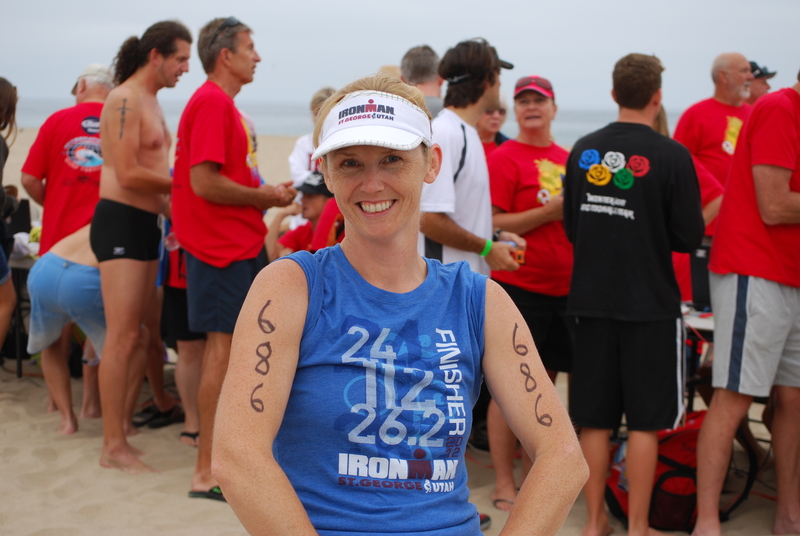 I might be up for a 3 mile swim at some point just to do something longer than the Ironman distance. But other than that, long OWS just isn’t for me. Great pace, Becca! That looks like so much fun! Thanks! 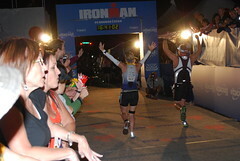 It really was fun even if I don’t want to do that kind of race again! Great job! Although I can’t fathom swimming 2 miles in open water, I am intrigued and might try one day. Congrats!! Looks like an adventure to try at least once!